It’s admirable that a bar of this caliber eschews the trend toward untenable pricing that would preclude most denizens of the Mission neighborhood where Obispo operates. On the other hand, printing its menus in Spanish seems to be pandering. But what most impresses here is that the authenticity of its cocktail menus, with its focus on the true rums of the Caribbean and their historical background, a culmination of Vogler’s meticulous scholarship on rum and distilled spirits, chronicled in his tome By the Smoke and the Smell. I first met Thad while he was bartending for Charles Phan at his first non-Vietnamese venture, Heaven’s Dog. We bonded over mutual aspirations to open our first establishment—coincidentally, I had already toured but turned down the opportunity to lease the new redevelopment at 355 11th Street, which eventually became home to his debut venture—but what I found truly revelatory was the meticulous scholarship he employed in researching and developing his authority on rum and spirits, a skill he honed as a literature major at Yale. Having a couple of Ivy League literature degrees myself, I realized that if I undertook my research into West Coast viticulture with the same academic intensity as Thad’s, I could position myself in unique vantage within the wine industry. Ten years later, I am ready to put my theory to test. From Obispo, I toddled over to Third Street to experience the newly-launched Ungrafted, the first large-scale wine bar to open in San Francisco in quite a few years. The brainchild of husband & wife sommeliers Chris Gaither and Rebecca Fineman, this split-level, 90-seat establishment is close, structurally, to what I have projected for the wine bar/restaurant portion of Sostevinobile. From this standpoint, I was duly impressed. 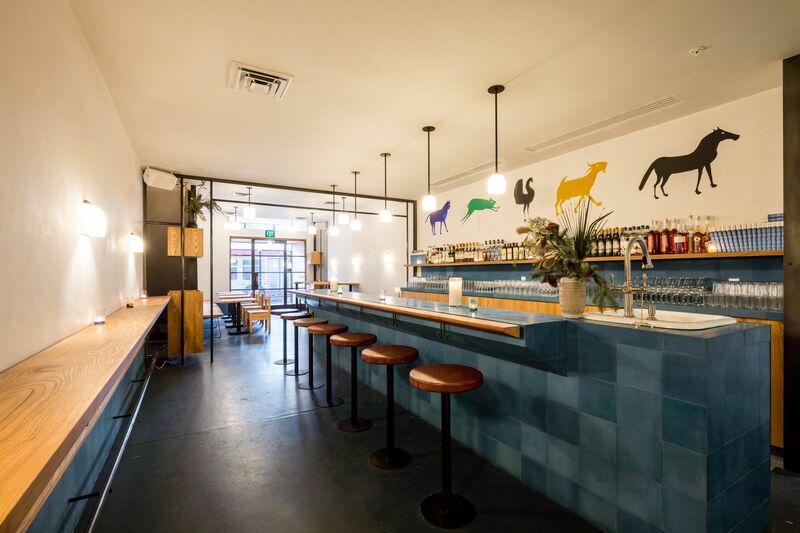 The layout still felt cozy and intimate, like a small venue, but dynamic in a way the ubiquitous living room-style winebars can never quite achieve. Importantly, Ungrafted’s 20′ ceilings enabled wonderful acoustics, allowing for ease of conversation even with ambient music playing in the background. As with Bar Agricole, I had also scoped out this sector of Dogpatch as a possible site, soon after the galleries at Minnesota Street Project had opened, but had felt the area was not sufficiently frequented to support my needs. Surprisingly, Ungrafted was fairly full this evening, with a decidedly mixed crowd, which I also took to be encouraging. But Ungrafted is a far different beast than Sostevinobile will be. As the wine program is handled by its two owners and operated by additional sommeliers as well, their by-the-glass program appears to be predominantly focused on food-pairing wines—quite suitable if you intend to dine there, difficult to swallow, if you had come merely to enjoy a glass on its own. I found myself sampling through three or four selections before settling on a compromise choice. Moreover, their paucity of California wines implicitly reflects the prevalent sommelier prejudice against our local offerings, while relying on such exotic-sounding labels as the 2016 Umathum Zweigelt/Blaüfrankisch/St. Laurent Rosé or the 2017 Heimann Kadarka Szekszárd to create the veneer of sophistication and depth. 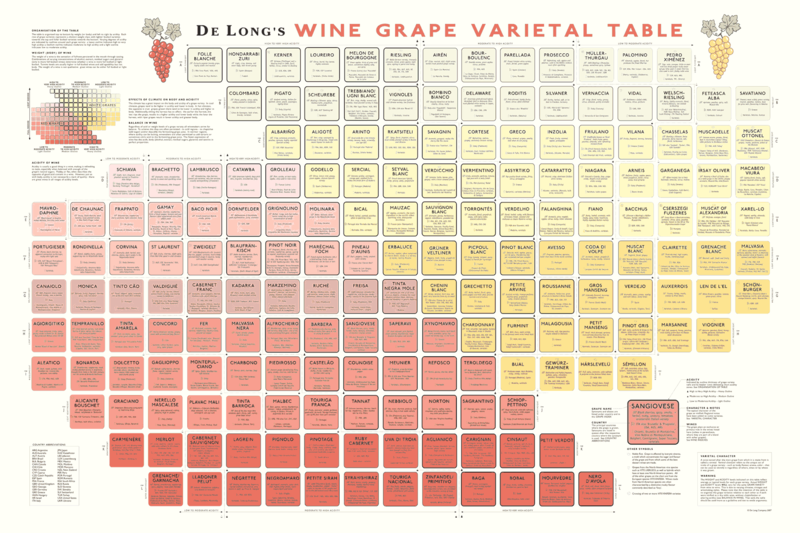 Coincidentally, while inspecting their restroom facilities, I came across a hanging of the ever-ubiquitous De Long’s Wine Grape Varietal Table, a fabled chart that categorizes some 180 different grape varietals used for vinification, including non-vitis vinifera, like Delaware and Niagara. Idling myself for an inconsiderate length of time to read through this extensive, though hardly exhaustive list, I counted 118 grapes that I have sourced in wines produced in California, Washington, and Oregon. Plus, I could easily name another 40 or 50 varietals, originating from multiple regions in Georgia, Greece, Italy, France, Spain, Portugal, Germany, Austria, and Switzerland, not included on this chart that are currently in production here, with more cuttings being suitcased in every year. As I have been promising for a decade, Sostevinobile will be featuring the most diverse selection of wines San Francisco has to offer, all from the 750-mile radius that defines our local, sustainable realm. I am looking forward to serving you there. This entry was posted in Uncategorized on January 16, 2019 by donaldmarc.